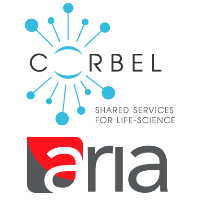 CORBEL and Instruct-ERIC are holding two ARIA training webinars for scientific reviewers and service providers in the CORBEL 2nd Open Call. ARIA is a cloud-based access management solution developed and managed by Instruct-ERIC, and in use by many organisations across Europe such as the CORBEL project. ARIA provides a single portal for scientific peer review, access visit management, and much more. For more information on ARIA please visit aria.structuralbiology.eu or contact aria@structuralbiology.eu. Both webinars will be recorded and made available for later viewing. The workflow in ARIA is general to all access routes and may also be of interest to reviewers and service providers involved in other access routes hosted in ARIA. Please note that the guidelines and review/evaluation forms are specific to the CORBEL open call. Other access routes hosted through ARIA (e.g. Instruct, iNEXT) will have their own guidelines and forms.